Peninsula Orthopedic Associates (Daly City) - Book Appointment Online! 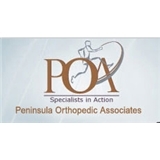 Let a Peninsula Orthopedic Associates (POA) physician be your preferred orthopedic specialist. Our highly skilled team of orthopedic professionals provides diagnosis and treatment for the musculoskeletal system. We specialize in orthopedic trauma and offer a center for joint replacement using the latest technologies available. As joint replacement surgeons, we make it a point to stay up-to-date with new orthopedic surgeries as they arise. It is our goal to always offer our patients the best care possible. That includes using the best technologies and treatments available. Book today to request an appointment with one of our highly-skilled orthopedic specialists. Experience the quality care offered by our POA doctors. Choose a POA professional as your Bay Area orthopedic specialist. Very informative Dr. very knoledgable and willing to explain and answer all questions. Excellent service stars for Ernie and Eric. Thank you so much. Very efficient, listened, and dealt with my health issues.